Around 1220 the old wooden bridge over the Thames at Lechlade was replaced by a stone one. To house the workmen entrusted with the building of it, a hospital or (almshouse) dedicated to Saint John the Baptist, was founded by Peter Fitzherbert. In 1472, the main priory was dissolved by Edward IV, but the almshouse continued as an inn known as "Ye Sygne of St. John Baptist Head" until 1704, when the name was changed to "The Trout Inn". Ancient Fishery Rights granted by Royal Charter to the Brethren are still held by the Trout Inn, which controls two miles of trout and coarse fishing waters. You cannot fish directly from the Trout land these days, but the stretch of water on the south bank between the lock and Lechlade can be used during the open season, and a bailiff patrols this and collects the fees from the bank. Over 700 years' tradition of hospitality in the provision of good food and drink is faithfully maintained today in this ancient inn. 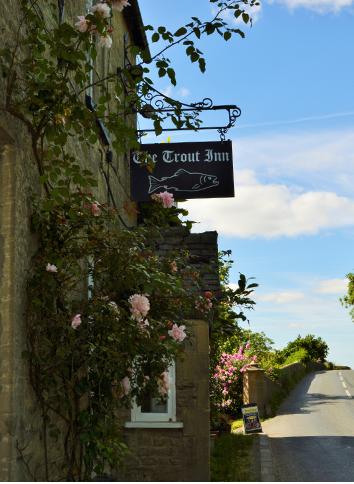 Penny Warren has been proprietor of the Trout Inn, our proper pub in Lechlade for over 29 years, and her aim has always been to maintain the Trout Inn as a traditional English inn. We have a riverside garden and during the summer we have a large marquee available for shelter. This, along with the Creel bar, which is a garden bar separate from the main building, can be booked for your party or business function. During the winter months we have a roaring log fire in the main bar, which has ancient wooden beams and some stone floors. We are not a fast food or gastro pub, just a family run proper country inn with a good range of real ales, ciders wines and spirits, all kept in a fine condition by Scott and a kitchen run with great panache by Penny. Our traditional pub food is home cooked to order by Penny and her team in the kitchen and all our meat is produced locally and is fully traceable. Our vegetables and salads are supplied by a local company and are always freshly prepared. We aim to offer a varied selection of dishes and always have special boards as well as our main menu. We are allergy aware, and are fully compliant with the new regulations which means we can provide you with the ingredients of any of our dishes. We offer gluten free choices and can cater to most dietary requirements. We offer a seniors' choice of two course lunch menus from Monday to Friday (excluding Bank Holidays) and we also have a children’s menu available. We support the local community wherever we can, letting many local groups and charities use our facilities free of charge. We also have a small jam shop which sells jams and chutneys made by Philippa Hunter, a local lady, who gives all the profits to Macmillan Cancer Care. She generally raises well over £3000 per year by selling her produce at the Trout, and we are all immensely proud of her achievements. Penny and her late husband Bob have both been awarded the Harold Dowler award by the Fairford and District Business club for service to the community. We also have a field at the rear of the Trout, which is used in the summer (weather permitting) as a field camp site. There are no showers or electric hook up, but it is the ideal place for a peaceful night beneath the stars.